Over the years, I've grown to love sweet potatoes more and more. This fall, I've probably used sweet potatoes more than ever before because my son Joel shares my love of these orange spuds too! 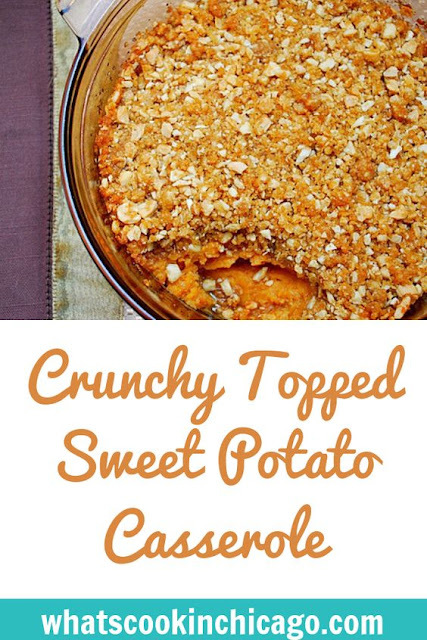 Well, for our recent Thanksgiving Potluck Playdate with fellow moms and kiddies, my friend Sara brought this Crunchy Topped Sweet Potato Casserole. I loved the varying textures of a crispy, crunchy top followed by the creamy whipped sweet potatoes. We liked it so much that I plan on making it again for our holiday table... and I think you should too! This could easily be made into a gluten free dish simply by substituting the all purpose flour with a gluten free flour blend. 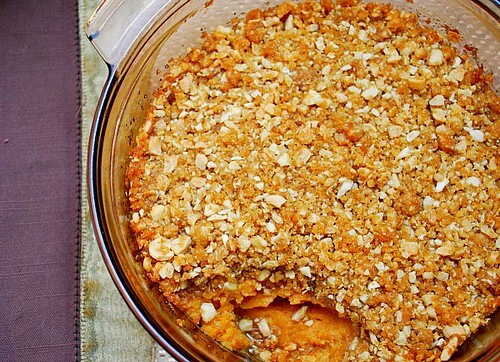 Aside from the sweet potatoes, what makes this casserole so great is the crunchy topping. Butter, sugar, a little flour start things off, but the key ingredients to the topping are the nuts and corn flakes. So if you have cornflakes lying around, here's the perfect opportunity to use them! In a large bowl, mix together all the casserole ingredients and beat until fluffy with a handmixer. Pour mixture into a greased baking dish. In a small bowl, melt butter; add brown sugar, flour, nuts and corn flakes. Pour over sweet potatoes and spread out evenly.